NFPE & AIPEU-GDS (NFPE) has filed a Writ Petition (Civil) No. 1003 of 2013 in the Hon’ble Supreme Court. The Writ Petition is likely to be listed for “ADMISSION HEARING” before the Hon’ble Supreme Court of India on 13.12.2013 or any day thereafter. Our main submission before the Hon’ble Supreme Court is implementation of the 1977 Judgment and grant of Civil Servant status and all other benefits of Departmental Employees to Gramin Dak Sewaks as per the 1977 judgment. Let us hope that the Writ Petition will be admitted. Copy of the letter received from Ministry of Finance is exhibited below. Com. T. K. R. Pillai, General Secretary, All India Association of Ministerial Staff (NG) has raised this issue in the National Secretariat meeting of the Confederation held at New Delhi on 28.11.2013. After detailed deliberations Com. S. K. Vyasji, Advisor, Confederation & JCM National Council, Standing Committee member has opined that eventhough this issue is a part of Anomaly Committee, due to non-holding of the Committee no finality has been reached till now. As Government has announced 7th CPC there is every possibility of Government referring the anomalies to 7th CPC. Hence he advised Com. T. K. R. Pillai to seek legal remedy also while continuing our efforts to settle the issue in the Anomaly Committee. 2nd National Women’s Convention of Confederation of Central Government Employees & Workers was held from 25th November, 2013 to 26th November, 2013 at Multi purpose hall, Civic Centre, New Delhi. Pro. Usta Patnaik, Professor Emeritus, Jawaharlal Nehru University inaugurated the Convention. Com. Amarajit Kaur, Secretary, AITUC delivered the key-note address. The inaugural Session is presided by Com. Gita Ghosal, Chairperson of the Women’s Committee. Com. C. P. Shobhana, Convenor of Women’s Committee, Com. S.K. Vyasji, Advisor, Confederation of Central Government Employees And Workers, Com. KKN Kutty, President of CCGEW and Com. M. Krishnan, Secretary General, CCGEW were on the Dias. The Convention commenced with progressive songs by West Bengal delegates. Chairperson announced the constitution of the Credential Committee consisting of Com. Seetha Lakshmi (NFPE), Com. Manisha Mazumdar (Printing & Stationery) Com. Jyothi Samal (Atomic Energy) Com. Jaitha (Audit & Accounts), Com. Nirmala (ITEF) and also the Minutes Committee consisting of Com. Mausumi Majumdar (NFPE) and Com. Laxmi Swaminathan (Civil Accounts). Prof. Usta Patnaik, in her inaugural address provided a bird’s eye view of the economic model designed by the neo-liberal policies and the resultant misery heaped on the mass of Indian population. In her classic presentation she demolished the arguments of some economists, who glorified the benefits of neo-liberal policies, by quoting the statistics from the database of the National Sample Survey. Undoubtedly top 25% of Indian population enjoyed the goodies as enjoyed by their counterparts in USA and Europe due to the EMI (equated monthly instalments). This is one of the rosy pictures the hegemonists of neo-economic policy present in support of this economic model. If income distribution is analyzed, it will be clear, that majority of the population is exploited for the benefit of the miniscule. The mass of the rural and urban population is pushed to malnutrition. The required calories per day in the rural areas and urban areas are 2200 and 2100 respectively. But the 90% of people living in urban areas are sustaining with below 1800 calories. Compared to the year 1983 the mass of the population is cutting down their food intake of their families and diverting their incomes to meet the raising cost of health, education and transport. This reflects the disgraceful state of affairs even after more than 60 years of Independence. The women employees working in garment factories in the Export Zones are being exploited to the hilt. The daily targets of work are high and hence, the women employees are forced to work for more than 10 hours per day to complete the targets. The toilet break is only for 10 minutes. Frequently drinking of water is not allowed so that no more toilet breaks. No identity cards are given, so that no one establishes the permanency of the job. All these woes came out in a public hearing of women employees who work in garment export zones of Tamilnadu. Agrarian crisis is compounded since the implementation of these neo-liberal economic policies. Compared to the years 2004-05 the economic growth by the year 2009-10 collapsed. Unemployment is in raise. The FRBM Act (Fiscal Responsibility and Budget Management Act) introduced in the year 2003 at the behest of World Bank led to the cut in Governmental expenditure. It is estimated that every Rs.100 less spent by Government will result in Rs.500 less in the income of the people. That means the budgetary support will spurt the economic growth. This was killed by FRBM. Agrarian crisis worsened due to non-availability of easy credit for agriculture. Even the nationalized banks replicated the US model of easy credit to buy the consumer goods. Thus the consumer credit is pushed. It aggravated the crisis. All these policies directly or indirectly affected the common people of rural and urban areas including the women. Prof. Usta Patnaik called upon all the women employees to realize these aspects and fight to stop these policies. With her fiery and powerful keynote address Com. Amarjit Kaur, Secretary, AITUC made a strong case for more and more participation of women employees in Trade Union activities. Taking the cue from Prof. Usta Patnaik speech, she reminded the participants of the Convention of their role as a privileged class in emancipation of the drudgery of large mass of women employees working in unorganized sectors. The women and children working in the slate-manufacturing units of Andhra Pradesh and Uttar Pradesh are deprived of their basic necessities of life. The children are driven out of schools in search of daily lively hood for the family. The silicosis disease engulfed the prime age of the people of these regions. No health-care for them. No permanent employment for them. The plight of women workers in the Export Zones of Fisheries is horrible. Continuous and untimely work in the saline and cold seawaters has even disturbed the biological order. These contract workers have no rights and even attempt to unionize will not be spared. The women employees working in many such sectors have no maternity leave, not to think of Child Care leave. The crisis in agrarian sector pushed the life of rural population below animal state of living. The “gobar anaj” the grain collected from the dung of the animals for human consumption in areas like Bundhelkhand is the reflection of the shattered Indian economy under the neo-liberal policies of the Rulers. The entire Working Class, keeping the banner inhibitions aside, came together and is waging a battle to defeat these policies. The Women has inherited a rich tradition of fighting spirit from the First Independent battle fought by Rani Jhansi and from the Indian freedom movement. They should assert their role and fight not only for their rights but also fight for the under privileged. Com. Amarjit Kaur exhorted the women employees to take this challenge. She advised the women employees to strengthen the unions and work in the unions. She suggested to organize the women employees by conducting exclusive trade union classes to equip them with the knowledge of the various legislations enacted to safe guard the women employees. Com. S.K. Vyasji, the Advisor of the CCGEW also opined that the women employees should have the knowledge of all the Acts to defend them selves against the harassment in work places. The grievance cell formation for women in each establishment should be insisted. The unity among the employees is important to fight out the harassment of women employees. He wished the Convention a great success. Com. KKN Kutty, President, CCGEW has extensively spoken on the charter of demands including the wage revision and merger of D.A. He delved on the situation after the announcement of constitution of 7th Central Pay Commission. Com. KKN gave a Clarion call to all women employees to unite and participate in the future struggles under the banner of CCGEW to realize the Charter of Demands. Com. Shobana, Convenor, Women’s Committee submitted her report. She told that the Confederation is a strong organization representing the 13 lakh Central Government employees. The restrictions imposed on the grant of CCL are removed to some extent because of the efforts CCGEW. Whatever achievement so far made is possible because of the united struggles waged under the banner of CCGEW. She narrated how the GDS, Casual and Contract workers in the Postal Department are discriminated. The decisions taken in the first Women’s Convention held at Kolkata have been implemented. She requested all the women employees to participate in large number in the ensuing March to Parliament at Delhi on 12-12-2013 and also in all the campaign and struggle programmes of Confederation. Com. K. P. Rajagopal, Secretary General, Income Tax Employees Federation, Com. M.S.Raja, Secretary General, All India Audit & Accounts Association, Com. I.S.Dabas, Deputy Secretary General, NFPE, Com. Brigu, Secretary General, Civil Accounts Employees Association, greeted the Convention. About 117 women delegates representing various Organisations from the nook and corner of the country participated in the Convention. The remarkable feature of this 2nd Convention as observed by Com. S.K.Vyasji, is that the women representatives have become more vocal and assertive. In the discussions more than 20 delegated participated and given their suggestions and brought the problems to the notice of the leadership. Removal of age restriction of the children under CCL, extension of CCL on remarriage, grant of CCL to look after the grand children, providing basic amenities at the work place, problems of casual, contract and out-sourced women employees, attacks on women employees in West Bengal, enhancement of minimum age of employment, inclusion of two women representatives from casual and contract workers in the mahila committee, posting women in day shifts, apart from the policy demands of reservation for women in all All India Committees, holding of periodical meetings of the Mahila Sub-Committee are some of the issues raised by the women delegates. Many Women delegates emphasized the need for strengthening the unions and need for inculcation of union spirit among the women employees. Karnataka Women delegates led by Com. Chandramma Linga Raju, AIPAEA, honoured Com. S.K. Vyasji over a standing ovation given by the entire delegates and guests present in the Convention. Com. M. Krishnan, Secretary General, CCGEW, summed up the entire proceedings and told that the aim of formation of Mahila sub committee is to encourage the more and more women employees to participate in the decision making process. The Chairperson and the Convener of the Mahila Sub-Committee are members of the National Executive of the Confederation and they are part of decision-making body. He assured that in the coming days more and more women members will be included in the Executive Committees of All India Organisations. He touched all the issues raised in the discussion by the delegates and assured that each and every problem and demand raised by the delegates will be discussed in the Confederation and a separate Women Charter of Demands will be prepared along with the Memorandum to be submitted to the Government and 7th CPC. This Charter and Memorandum will be circulated and published on all the web sites of all organisations and will be given wide publicity and a feedback will be obtained before finalization. He thanked the Delhi CoC for the excellent arrangements made to conduct the Convention in a very good environment. The new panel for the Mahila sub-Committee has been elected unanimously. Com. Usha Bonepalli, ITEF, Andhra Pradesh has been elected Chairperson and Com. Seetha Laksmi, NFPE, Karnataka, has been elected Convener. The 2nd National Convention of Women ended successfully with a resolve to work for the strengthening of the Confederation and mobilize the entirety of women employees in the future activities of the Confederation. The confidence and strong determination generated among the women comrades will go a long way for the success of all the future struggles. Guide on the Right to Information Act, 2005 - updated Version. 1. 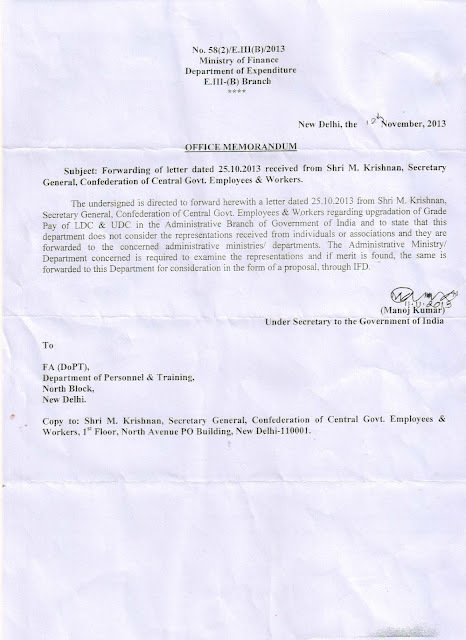 The National Secretariat of the Confederation of Central Government Employees and Workers met at New Delhi on 28.11.2013 and reviewed the situation arising out of the Government’s announcement of Seventh Central Pay Commission and the subsequent developments thereon. 2. 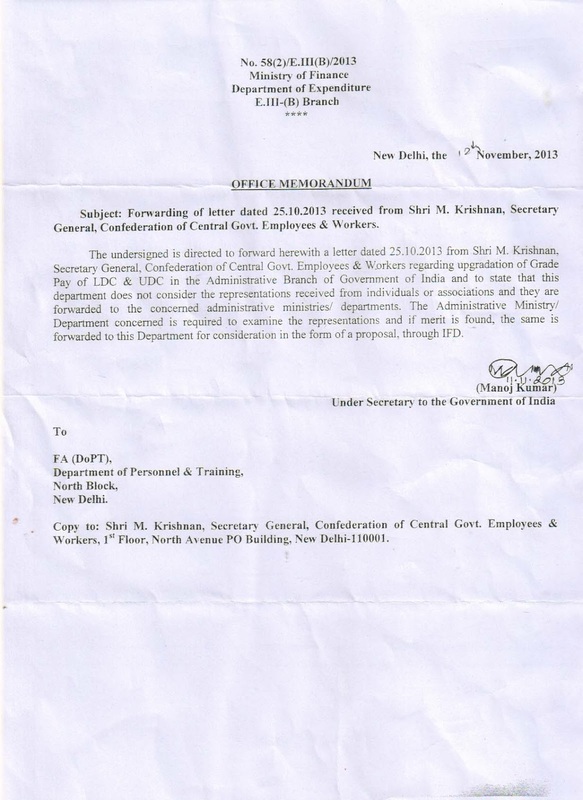 Eventhough Government has announced constitution of 7th Central Pay Commission, the appointment is yet to take place. In the meanwhile one round of discussion was held with Secretary, DOP&T on terms of reference. Subsequently, the staff side, JCM National Council has submitted a unanimous proposal on the items to be included in the terms of reference of the 7th CPC, which includes (i) date of effect as 01.01.2014 (2) merger of DA with pay (3) grant of interim relief (4) inclusion of GDS under the ambit of 7th CPC (5) statutory pension for those entered into service on or after 01.01.2004 (6) settlement of anomalies of 6th CPC (7) cashless/hassle-free medicare facilities etc. Further all of us are aware that the political situation in the country is gradually getting in election mode. This is bringing forth before the working class movement a crucial task of front-loading our class issues in the ensuring political battle. We have to keep in mind that the corporate class and corporate controlled media has started making effort for relegating the working class issues and the economic policy related issues in particular to the background. It is our duty to bring the demands of the working class to the fore-front and conduct intensive campaign against those policies and also against those who are supporting the neo-liberal globalization policies. Confederation of Central Government Employees & Workers being the part and parcel of the mainstream of the working class of our country has got an added responsibility to rally the entire Central Government Employees in the joint struggle against the anti-people and anti-worker policies of the Government which shall ultimately lead to a change in the political equation ensuring implementation of pro-people, pro-worker alternative policy. Taking into Consideration all the above facts and circumstances, the National Secretariat of the Confederation of Central Government Employees & Workers met at new Delhi on 28.11.2013 took a unanimous decision to go for strike if the Government refuse to accept the staff side proposal on terms of reference. Confederation further decided to organize series of phased programme of action and campaign from now onwards so that the employees will be ready to go for strike on short notice. It is further decided that Confederation shall not go for any compromise on the demands raised in the proposal submitted by the JCM Staff side on terms of reference of 7th CPC. 3. The following are the important decision of the National Secretariat. 1. The earlier decision to defer the strike ballot after the announcement of the 7th CPC by the Government is ratified. Under the given circumstances the decision taken to defer the ballot was perfectly right. 2. The modification made in the Confederation Charter of Demands regarding date of effect of the 7th CPC (i.e. from 01.01.2011 to 01.01.2014) is approved as it was necessitated for arriving at unanimity among the staff side on term of reference which will strengthen further the unity of all Central Government organizations including Railways and Defence. 4. Decided to conduct the following phased programme of campaign and agitational programmes. (a) Convening the Managing bodies/Executive Committees of all affiliated organizations to discuss and ratify the Confederation decision to go for agitational programmes culminating in strike. (b) Sector-wise/organisation-wise intensive campaign among the employees by conducting squad work, General body meetings, conventions, postering and issuing printed pamphlets, lunch hour meetings etc, explaining the demands raised in the charter of demands and also the necessity to go for strike if our demands on terms of reference are not accepted. All India/State Leaders of the affiliated organizations shall under-take extensive tour as part of campaign programme. (c) The campaign tour programme finalized by the Secretariat meeting earlier is to be implemented. Whereever State level and C-O-C level conventions are yet to be held, it should be held before 20.12.2013. All State Committees and C-O-Cs are requested to organize conventions immediately. The name of the Confederation National leaders who are attending the conventions is given in the enclosed circular. Date of the Conventions may be fixed in consultation with the concerned comrade. (d) Decided to conduct nationwide day-long dharna programme at maximum centres, particularly at the state capitals on 2013 December 19th (19.12.2013) with massive participation of employees. Effort is to be made for maximum media coverage of the programmes. (e) Decided to organize mass rallies at all State capitals (and if possible at District Capitals also) before 31.12.2013. National leaders of the Confederation and other trade Union leaders may be invited to address the rallies. All effort should be made to make the rally a grand success ensuring maximum participation of employees. (f) Decided to conduct press conferences at all State capitals (other centres also if possible) by the State committees/C-O-Cs to explain the justification of demands and also the proposed strike action. (h) Mass dharna at New Delhi on 9th January 2014 by All India Leaders of Confederation and leaders of all affiliated organizations and C-O-Cs and also maximum number of employees from Delhi and nearby states. (i) Extended National Executive meeting of Confederation will be held at New Delhi on 10.01.2014 (10th January 2014) for declaration of the strike date and also the duration of the strike. All the National Secretariat members of the Confederation, All the C-O-C Representatives and all the Chief Executives of the affiliated organizations of Confederation shall attend the mass dharna on 9th January and the Extended National Executive meeting on 10th January 2014 WITHOUT FAIL. (Please book the up and down ticket immediately to ensure the participation on both days i.e. on 9th & 10th January 2014) If any organisation or C-O-C wants participation of more comrades in the extended National Executive as observers it will be allowed subject to a maximum of five) Participation in the Dharna is allowed without any limit. 5. Decided to extend full support and solidarity to the proposed strike action of NFPE & FNPO on demands of Gramin Dak Sevaks (GDS) and Casual, Part-time, Contingent employees. It is decided to request the Postal JCA to adjust the date of the strike so that it will be a strike of all Central Government Employees. 6. Decided to file a case in the Kolkata High Court challenging the PFRDA Bill passed by the Parliament jointly with the All India State Government Employees Federation (AISGEF). The methodology for raising funds for meeting the expenses for the conducting of the case up to Supreme Court will be decided in the next meeting. C-O-C West Bengal is authorized to assist the National Secretariat in completing the formalities for filling the case in the Kolkata High Court in consultation with AISGEF. 7. Decided to mobilize maximum employees for participating in the 12th December Parliament March organized by the Central Trade Unions against the anti-people, anti-worker policies of the Central Government. C-O-C Delhi and C-O-Cs of nearby states and also all affiliated organizations are requested to ensure large scale participation of the employees in the 12th December Parliament March. It is decided that each organisation shall conduct workers meeting at all important centres in Delhi and nearby states for mobilizing maximum employees to participate in the march. 8. Decided to extend maximum support and solidarity to the 11th December 2013 Parliament March organized by the AIPEU-GDS (NFPE) demanding settlement of GDS demands. Delhi C-O-C is requested to extent maximum support for the successful conduct of the GDS Parliament March. 9. The National Secretariat placed on record its sincere thanks to all the state committees/C-O-Cs and also all the affiliated organisations for making the All India Trade Union Education Camp conducted at Mumbai on 14th & 15th November 2013 and also the All India Women’s Convention held at Delhi on 25th & 26th November 2013 a grand success, especially to the C-O-C Mumbai and C-O-C Delhi for providing all the infra-structural facilities in an excellent manner. 10. Decided to appeal to all affiliated organisations to clear the quota dues towards Confederation CHQ before 31.12.2013. Financial Secretary shall issue separate notices to each organisation indicating the total dues to be remitted. 11. It is decided that Com. M. Krishnan, Secretary General shall represent the Confederation as an official delegate in the International Congress of Southern Initiative on Globalisation and Trade Union Rights (SIGTUR) to be held at Perth, Australia from 2nd to 6th December 2013. The National Secretariat meeting was presided over by Com. K. K. N. Kutty, the National President. Com. S. K. Vyasji, Advisor, was present and gave his valuable guidance for arriving at correct conclusion and decisions on each agenda items. Com. M. Krishnan, Secretary General, presented the organizational report. It is hereby notified that the Extended National Executive Committee meeting of the Confederation of Central Government Employees & Workers will be held at New Delhi on 10th January 2014 (10.01.2014 Friday) from 10:00 AM to 5 PM. All National Secretariat Members (office Bearers), Chief Executives of affiliated organizations, General Secretaries/Representatives of all C-O-Cs should attend the meeting WITHOUT FAIL. 1. Review of the campaign and agitational programmes conducted and declaration of the strike and finalization of the duration of the strike in case Government refuse to accept the demands raised in the modified Confederation Charter of Demands. 2. Any other demands with the permission of the chair. All Chief Executives of affiliated organisations.